BEETLE HOUSE! BEETLE HOUSE! BEETLE HOUSE! and the coolest themed bar in the East Village!! themed bar was an absolute must-do for a fan like me of Nightmare Before Christmas, Edward Scissorhands, Beetlejuice, Batman (I’m talking the 1988 original guys)…and countless other classics!! Full Video at the bottom of this Article! Getting My Drink On at Beetle House!! It’s the This is Halloween Drink!! and a great start to the night! This one had a bite! Poisons and Elixirs are right!! A mixture of Tequila(yowza 😯 ), Mango, Lime, Agave Syrup, and Chipotle Powder. This drink was really good until that chipotle kicks you in the throat!! This drink is aptly named for sure!! Of course, we had to order The Beetle’s Juice at Beetle House!! This one was my absolute favorite of the night!! Tequila(again, really?! ), Muddled Blackberry…I didn’t even realize I liked muddled blackberry and Cranberry Juice. I was feeling the buzz! This one was my other favorite of the night. doesn’t sound like the greatest mixture but it was delicious. Oh yeah, the music in Beetle House was on point! , and more played while we continued to sit and get our drink on!! To seal the deal we decided to end the night with a dessert cocktail. What better dessert cocktail than a Willy Wonka themed drink!! I would have swam in this Chocolate Chocolate Martini for sure! Did you guys know?!? The Chocolate River sequence in Tim Burton’s Charlie and the Chocolate Factory was actually 192,000 gallons of faux melted chocolate. Tim Burton wanted the river to look more realistic than the “distasteful” river from the first movie. Nine different shade of chocolate were tested before he picked the perfect one!! 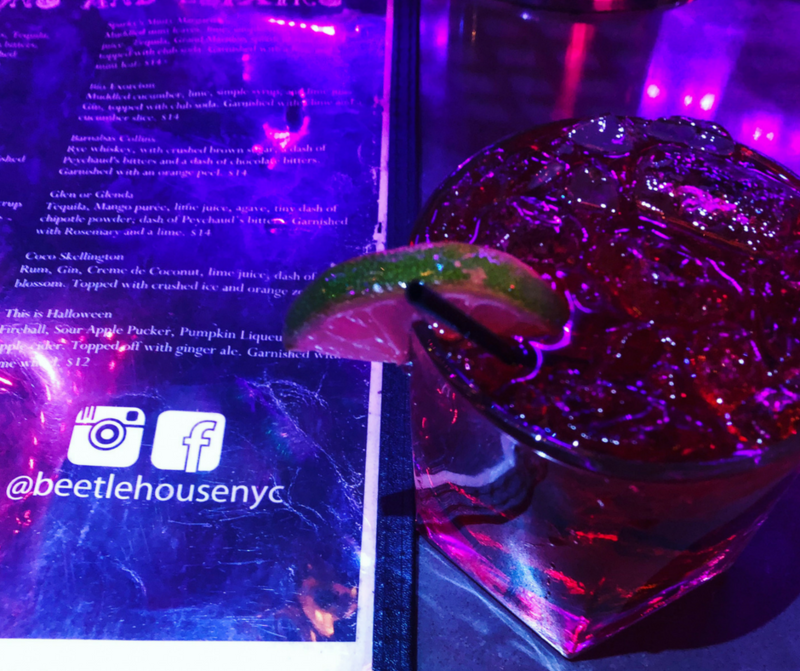 Beetle House does offer a full menu of entrees and appetizers but we had arrived after the kitchen closed so we made it a night of fun drinks!! There is also a Beetle House on the West Coast in Los Angeles and yes I plan on going there too!! Feel free to like & share!! Be sure to check out all the other big city fun I’ve had over in the NYC section of Vivacious Views!! Click Here for more info! What’s your favorite Tim Burton film?! ?